Pas de Deux Dance Studio's ballet productions give our dancers the chance to experience participating in a full scale show. Dancers of all ages and ability levels work together to produce a spectacular experience for ballet fans and first timers. Pas de Deux Dance Studio's "The Nutcracker" keeps the traditional elements of the ballet (Victorian time-period, Waltz of the Snowflakes, and entertainment for Clara and the Prince in the second act) while adding some twists to keep the story fresh. 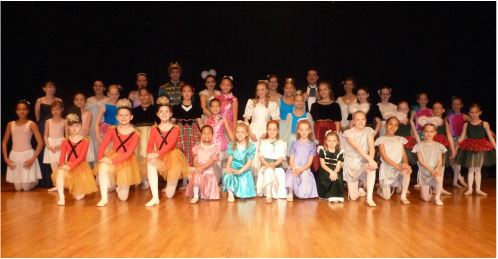 Pas de Deux Dance Studio provides an updated twist on the classic fairy tale in their production of "A Sleeping Beauty". The young princess Aurora is cursed at her christening by the evil fairy Carbose to prick her finger on a spindle before her 16th birthday and die. While unable to remove the curse, the Lilac Fairy is able to adjust it so that Aurora falls into a deep sleep instead of dying. Will Aurora's older sister, Aylin, be able to save her, or will she be caught in the curse as well? Auditions are open to current Pas de Deux Dance Studio members, as well as ballet dancers from the Twin Cities community. All dancers are required to go through the same audition process, and no dancers receive any payment for being in the production. There are also non-ballet and non-dancing parts available for teen and adult dancers. Support our productions through advertising, donating items, volunteering and shopping! Tickets to any of our ballet productions are available in advance directly through the studio, or at the door.